A professional pitcher threw a tad harder than yours truly and reached a milestone he spent 18 seasons trying to achieve. 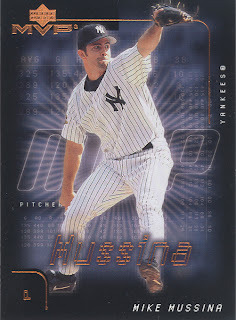 The sad part of Mussina’s career is he never won a World Series or a Cy Young. He pitched a gem in Game 3 of the 2003 World Series against the Marlins, outdueling Josh Beckett, but the Marlins rallied for three straight wins after that. Mussina is a borderline Hall of Famer, as he finished with 270 wins, 2,813 strikeouts, a 3.68 ERA a 1.19 WHIP, and was a five-time All-Star selection. He finished in the top five of Cy Young voting six times, but never won. My vote: No, but once he’s eligible he’ll definitely make the ballot and receive some votes. No Yankee has worn No. 35 since he retired, as far as I know, so perhaps he’ll be remembered in Yankee Stadium’s Monument Park. My vote: Yes.